Brockelmann’s History of Arabic literature does list English translations known in 1940. One of these was by Alfred von Kramer, from 1854, and was a translation of al-Wakidi’s biography of Mohammed. It was published in British India at Calcutta as the History of Muhammad’s Campaigns by Aboo Abd Ollah Mohammad bin Omar al Wakidy, by the Baptist Mission Press. Three works on the biography of Mohammad, from which the whole stock of information regarding the establishment and development of the Islam may be derived, have come down to our days, and are existing in different libraries. I. The first is Ibn Hishâm’s biography of Mohammad known commonly by the title of “Syrat-Ibn-Hishâm.” Its author died A. H. 213 (A. D. 828) or according to others A. H. 218 (A. D. 833) and his work is an extract from the chronicle of Ibn Ishâk who died about A. H. 151 (A. D. 768). Thus, through Ibn Hishâm’s médium, we get access to Ibn Ishâk’s work, though in some instances Ibn Hishâm seems to have made some pious alterations tending to cover up many of the prophet’s weaknesses and deficiencies *. A complete copy of Ibn Hishâm’s work is in the imperial library at Paris. 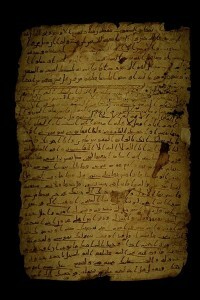 An abridgment of Ibn Hishâm’s book was made at Damascus A. H. 707 (A. D. 1307,) by Ahmad Ibn Ibrahym, Ibn Abd-ar-Rahman-al-Wâsity, of which a copy is preserved in the Asiatic Society’s Library at Calcutta. II. The second work is Mohammad Ibn Sa’d’s work, commonly called Tabakât or annals. Some volumes of “the Tabakât are in the ducal library of Gotha;” Mr. Wüstenfeld has given a notice of their contents in the fourth and seventh volumes of the Journal of the German Asiatic Society. Another volume of the Tabakât containing the biography of Mohammad is in Dr. Sprenger’s hands, whose indefatigable researches were recompensed by the discovery of this volume in a library belonging to Mozaffar Khân at Cawnpoor, and who has recently discovered some other volumes in Damascus. * Consult on this question the excellent dissertation on “the original sources for the biography of Mohammad” inserted in the Calcutta Review No. XXXVII. for March, 1853. Ibn Sa’d, who was Wâkidy’s secretary, acquired great knowledge of historical and traditional matters from his master, after whose death he condensed in his “Tabakât-al-Kabyr,” a work consisting of fifteen volumes, the results of Wâkidy’s historical researches, which were scattered through this author’s numerous works. Such at least is Ibn Khillikân’s opinion, and it seems that Ibn Sa’d, without much trouble of his own, gathered the fruits of his master’s untiring studies. III. The third standard-work is Tabary’s history. Aboo Ja’far Ibn Jaryr-al-Tabary was born A, H. 224 (A. D. 838-9) at Amool in Tabaristân and died at Baghdad A. H. 310 (A. D, 923). He was considered by his contemporaries, as the greatest authority in historical and traditional matters. His great work on the history of the Islam, some volumes of which exist in several libraries, seems to justify the high consideration in which he is held by all subsequent Arabic historians. His work is written with great conscientiousness, he always indicates the names of the persons, on whose testimony a fact is narrated, and a cursory perusal of his book will convince every reader, that Tabary wrote with the sincere intention of composing a true and impartial history. Though these three chief works reflect, however troubled this mirror’s surface may be, the great outlines of the early history of the Islam, yet they are far from enabling us to get a clear view and to form a just idea of those remote ages. Not one of these authors ever thought of submitting to a critical inquiry the authenticity of the traditions, which had been collected by his predecessors, not one of them dared to question the veracity of the most extravagant stories told about their prophet’s miracles, and Ibn Hishâm, as has been observed already, did not hesitate to commit some pious alterations in Ibn Ishâk’s text tending to cover some of Mohammad’s errors. * Ibn Sa’d, whose works are mere extracts from the writings of his master, must be considered as a second-hand writer, and probably would lose every authority, if his master’s works had not perished. * Consult on Ibn Hishâm Dr. Sprenger’s Life of Mohammad, p. 70. Tabary is doubtless a scholar superior in knowledge and trust, worthiness to both Ibn Hishâm and Ibn Sa’d, but unfortunately he lived at an epoch too remote from the foundation of the Islam. At his time the fertile imagination of the Arabs had veiled the origin of their religion and their prophet’s rising in such a cloud of poetical legends, that it was utterly impossible for any Mohammadan writer to discern the true from the false. Aboo Abd Allah Mohammad Ibn O’mar Ibn Wâkid-al-Wâkidy was born at Madynah A. H. 130 (777) ; he was a manumitted of the Banoo Hâshim and professed the Shy’ah doctrines, From Madynah he migrated to Baghdad, where at first he obtained the post of Kadhy in the eastern suburb, afterwards the Kalyfe Mamoon conferred upon him the same dignity in O’skaral-Mahdy another suburb of Baghdad, which at Ibn Khillikân’s time was commonly called Rossâfah. Mamoon held him in the greatest esteem. At his death he left a library of six hundred chests full of books, which were sold for two thousand dynârs. Wâkidy always kept two slaves, who were continually busy in copying manuscripts for his library. He is author of thirty-two works ; it suffices to indicate here only those, which appear to be the most important. * (1) The campaigns of Mohammad (Kitâb al-Maghazy). (2) The history of the apostates, having for its subject the history of those, who after the death of Mohammad, apostatized from the Islam and relapsed into idolatry. (3) History of the wars of Mohammad’s companions against Tobayhat Ibn Khowaylid-al-Azdy, Aswad-al-A’nsy and Mosaylamat-al Kaddâb. (4) History of Makkah. (5) History of the Conquest of Syria. (6) History of the Conquest of I’râk. (7) On the battle of the Camel. (8) On the battle of Siffyn. (9) On the battles of the Banoo Aws and Khazraj. (10) On the death of Mohammad. (11) Biography of Aboo-Bakr. * This séries of works is quite sufficient to prove the high literary character of our author. Wâkidy died at the age of seventy-seven years in Baghdad. * See Hammer-Purgstall’s Literaturgeschichte III. p. 403. It is the first named work of this eminent scholar which is contained in this volume: viz. the Kitab-al-Maghâzy, or History of the military campaigns of the prophet. The original manuscript was discovered by the editor at Damascus in 1851, and as no other copy of this work is known to exist in any library, it is presumed to be the only one of Wâkidy’s works, which has escaped the all-destroying tooth of time. That is quite a nice English-language summary. After struggling with Brockelmann, it is pleasant to see something outlined so clearly! Brockelmann states, however, that this translation is only partial. An unpublished English translation of Abd al-Latif? It’s always worth doing a Google trawl. You never know what you may find. This evening I was idly looking to see what I could find in English by Galen. I kept hitting “next page”. Much of it was dross. But then… I struck gold. I found myself looking at a page at the British National Archives. It turned out to be a catalogue of papers held at the Royal College of Physicians in London, once belonging to a certain Dr Greenhill. Greenhill, whoever he was, was interested in Galen and in the Arabic material about him. There are translations of extracts from the great biographical dictionary of medical writers by Ibn Abi Usaibia. These are probably good themselves, tho brief. Now as far as I know there is no published English translation of this work, although of course I am no Arabist and I might be quite mistaken. But here is 140 pages of translation in manuscript! This, surely, needs to be copied and placed online? I’ve enquired about the possibilities here. But I also see various standard works in German on the subject, bound interleaved with blank paper on which the good doctor has written notes. These too might be very interesting! Mind you, a thought has struck me. Given the notorious badness of the handwriting of members of the medical profession, will we be able to read any of what he wrote? Posted in From my diary, Other ArabicTagged From my diary, Ibn Abi Usaibia, Information access, Other Arabic4 Comments on An unpublished English translation of Abd al-Latif? Yesterday I started to compile a list of the passages in Galen where he mentions the Christians. I believe that there are six. Unfortunately Walzer’s book Galen on Jews and Christians has not arrived, so I had to make do with whatever PDF’s I had. Two of the fragments come from Arabic authors of the middle ages. I had a couple of PDF’s by Sprengling in which he analysed these. I noticed that he attributed one of them to Agapius, and that other Islamic historians copied him. But the Patrologia Orientalis edition and translation has no material about Galen! So I suspect that it is the other way around. For the CSCO edition of Agapius uses material from al-Makin, writing 3 centuries later, on the basis that al-Makin quotes Agapius extensively. So, far from being present in Agapius and copied by later writers, probably it is present in al-Makin, and al-Makin borrowed the Galen material from Islamic writers! But that’s a detail. However it pointed out to me, what has been apparent for some time, that I need to have an overview of the historians and translators of the Islamic period. So last night I picked up a pencil and my copy of Brockelmann’s Geschichte der arabischen Litteratur (2nd ed., vol 1 of 2, 1943) and took it to bed with me. I started looking at the section on the Islamic historians of the post-classical period, and scribbling notes in the margin. Today I continued by doing the same for the classical period (ca. 750-1000 AD). It’s a weird book, it really is. I can only explain its baffling structure by presuming that much of it was composed in an air-raid shelter by people who hadn’t slept properly for six months. Firstly, and most damningly, it isn’t complete. I’ve only got volume 1 of the 2nd edition, which covers history up to ca. 1500. This has numbers in the margin, which look to me like the page numbers of the first edition. Why on earth would you need these, we might ask? The answer lies in the text, where, for many writers, there is only a short entry and then “See Suppl. I”. Or else there is a longish entry, but the list of works by that author consists of numbers 1, 5 and 6; and there is a note “2-4 see Suppl.”. Brockelmann published his first edition in two volumes ca. 1900. In the late 30’s he published two volumes of supplements to the first edition, keyed to the page numbers of the first edition. He published the second edition in 1943. You or I would imagine that the second edition consisted of the first edition plus the supplements plus some revisions. But in fact it seems to be just new material, plus some framework words. So to find all the information on a writer, you need to look in the 2nd ed., then in the supplement volume, and possibly in the first edition also since it is the page numbers of the first edition that are used in the supplement. This … is appalling. I can’t understand quite why Brill allowed a book to go out like this, and have left it in this state for 70 years. If I’d paid $1,000 for the 2nd edition, instead of producing a bound photocopy for my own use, I’d be pretty cross right now. Fortunately the first edition is on Archive.org, and the supplements can be found on a site in India. But I may still need to produce paper versions of these, as I can’t read these kinds of books on-screen. Nor is this the only problem. Someone new to the subject will find all the names rather unfamiliar. The average writer is given as the equivalent of “John son of Bill son of Harry son of John who lived in the Camden Town and was often known as Mad John”. When you see something of that length, you know, beyond doubt, that no-one repeats all that lot to refer to him. But in Brockelmann you have to scan the highly abbreviated notes beneath to work out that scholars call that author “the one from Camden Town” in the literature. Brockelmann does not feel that he needs to indicate this. I’ve ended up underlining parts of the names so I can tell that (e.g.) this long list of Arabic names is actually “al Tabari” or “al Mahsudi”. The sins of the author are visited on the reader, and Brockelmann committed many more sins than these. Here’s another. All those names are unfamiliar to the newcomer. So what he did was abbreviate them, to make them even less recognisable. Why say “ibn” when you can say “b.”? Why say “Ali” when you can say “A.”? Of course, if you are unfamiliar, this means that you can’t even read the name! And he doesn’t trouble to give a proper decryption key either. This is unforgiveable, really it is. We can only be grateful that he didn’t encode the names in Arabic characters as well. But he does his best to be difficult, using a strange version of “h” where normal people write “kh”. What I take from this is that there is an urgent need for a new History of Arabic Literature. It should have the same scope as Brockelmann, but be properly organised, and in English. The actual entries in Brockelmann are much too brief anyway, and I have no doubt that 70 years has brought many more editions and translations. If I were an academic working in this area, I would do it. It would make my name live for a century. If so bad a book as Brockelmann’s GAL is still the standard reference work, it should be trivial to surpass it. It could be done in a year or two. Nor is it necessary to translate Brockelmann, nor desirable to do so. Retain his structure, yes; and give a marginal reference to his pages. But it will be far easier to simply write your own text, rather than fight to understand his cryptic notes. I’d do it myself, except that I have to write software for mobile phone companies and the like in order to pay the electricity bill and so I don’t have the time. But … come on, chaps. This is a simple exercise that we could all do. Meanwhile, I think I shall look at getting a print-off from Suppl. vol. 1! UPDATE: I’m just looking at the PDF of the supplement, and, in this, he places the important bit of the name in italics! So he was clearly aware of the issue also. Again it shows that you can’t even read the GAL pages by themselves. Book 1. The Arab national literature. Section 1. From the beginnings to the emergence of Muhammad. Section 2. Muhammed and his times. Section 3. The Umayyad era. Book 2. Islamic literature in Arabic. Isn’t it interesting to see the large part played by poetry? I have volume 1 of Brockelmann’s Geschichte der arabischen Litteratur (2nd ed. 1941) on order via my library. But a correspondent sent me an interesting word document yesterday. He’d downloaded volume 1 of the 1898 first edition, run it through some OCR, and then run the output through Google Translate. The .doc file contained the result, which was really rather interesting, and by no means useless. Last night I also downloaded the PDF, and I ran Finereader 10 against it during the night. The results were not too bad, although I gather that quotations may not be handled that well. The PDF resolution is not that great, unfortunately. Footnotes tended to be handled rather badly. I started correcting the OCR of the main text, but had to go away unexpectedly, which prevented further progress. But I will do more next week, if Adam’s curse permits. While I was hunting for PDF’s of Brockelmann, I found another interesting item, Nicholson’s 1907 book, A literary history of the Arabs. This looked interesting enough that I ordered a version on paper from Amazon. We have to ignore the early chapters, dedicated to pre-islamic material — at least, that isn’t what I want to read about — but it gets quite interesting from the Ummayad period on. Something I can scribble on is what I need. I’m still cursing Brill for the price they place on Brockelmann’s second edition. A thousand dollars, for heaven’s sake, for a thousand page paperback!?! Let’s see what kind of a grasp of Arabic literature I can get. Using the form of the name “Ibn-e-Abi Useibia”, I was able to find a bunch of matches for “ibn abi usaybiah” in Worldcat. We’re looking, of course, for his ʻUyūn al-anbāʼ fī ṭabaqāt al-ʼaṭibbāʼ. It has things to say about Hippocrates and Galen, and also about Hunain ibn Ishaq. There are several publications listed in Worldcat. The catalogues indicate that he lived between 1203-1270. First, there is “Abdollatiphi bagdadensis vita”, 1808, Oxford, ed. J. Mousley, here. This is a Life of `Abd al-Latif al-Baghdadi, by our man. The latter also wrote, I find, a Historiae Aegyptiae Compendium, which I think we came across when looking at Bar Hebraeus and exists in Latin in the same sorts of places. There is a German publication Geschichte der Aertze, published “Königsberg : Selbstverlag, 1884” — is that “self-published?” — by August Muller, who turned up yesterday as the editor of the Arabic text in Cairo in 1882. This sounds very like a translation; but the record says “principally in Arabic”. There are no UK locations for it, nor US, nor even German! The latter, I think, probably reflects a lack of upload from German libraries, rather than lack of holdings. There is a copy in Paris, tho. There also seems to be a 1995 publication at Frankfurt-am-Main, in two volumes — I would guess this is a reprint of the 1882 edition. The 1882 edition exists in the British Library — so useless to us — and in three US libraries, including California and Chicago universities. There is a curious publication Oyūn-al-anbā fi tabaqat-al-attebba, Ahmad ibn al-Qasim Ibn Abi Usaybi`ah; trad. et commenté par Seyed Dja’far Ghazban et Mahmoud Nadjmabadi, Publisher: Tehran : Imprimerie Organization de l’Universite de Tehran, 1970-. Language is French. The only copy seems to be in “Radboud Universiteit Nijmegen” in the Netherlands. But then … I find a mysterious item, with no copies held. “English translations of History of Physicians (4 v.), and The Book of Medicine of Asaph the Physician (2 v.). 1971.” What can this be? A web search quickly turns up a source — in manuscript! — here. It’s MS C 294, a manuscript at the US National Library of Medicine! There’s no indication of any further information. It is a pity that WorldCat is so slow. But it has given several leads to the material we want. I shall now compose an email enquiring about that manuscript! UPDATE (5th August 2011): I was able to get PDF’s of the Muller publication, which is entirely in Arabic. No response ever appeared on the US item. R. Haddad wrote an interesting article Hunayn ibn Ishaq, apologiste chrétien (1974), which I was reading this evening, thanks to the kind gift of a bunch of articles over the weekend. On p.293-4 he gives details of the appalling treatment of the great translator by the Caliph al-Mamun, which apparently come from a History of medical writers by a certain Ibn Abi Useibia. The Arabic text was published in Cairo in 1882 by A. Müller. I won’t attempt to give the Arabic title, but Muller, Cairo, 1882 was enough for me to find the book in COPAC. This contains, on p.190-197, a long extract from On his own misfortunes. I can’t find any sign of an English translation of Useibia’s work. The nearest I can come is an extract from it, from 1834, by William Cureton, on physicians from India. It’s here. I don’t know how we could get access to the Arabic text; and what other version exists? The words quoted are from Ibn Abi Useibia’s work, apparently, pp.187-8 of the Cairo edition. Arabic literature is so unknown in the west. I’m interested; yet the only guide I can hear of is Brockelmann’s Geschichte der arabischen Literatur, which is multi-volume and, worse, in German. Why isn’t there an English translation? Why aren’t all these texts online in English? UPDATE: It seems that something does exist in English, in Dwight F. Reynolds, Interpreting the self: autobiography in the Arabic literary tradition. 2001, p.107-118. This covers the episode when he was entangled by his enemies in a palace intrigue under the Caliph Mutawakkil, and once again ended up in prison. Emily Cottrell has made a translation into English of the relevant passage from al-Qifti, based on Lippert’s edition, and kindly allowed it to appear here. Here it is. I am not absolutely sure that WordPress will allow some of the characters used — if it all gets corrupt, I shall simplify it. Yaḥyā al-Naḥwī the Egyptian, the Alexandrian, disciple of Severus. He was a bishop in the church of Alexandria in Egypt and he advocated the Jacobite way of the Christians, but later on he rejected what was believed by the Christians about the Trinity after having read philosophical books, and it became impossible for him [to believe] that the One had become Three and that the Three would be One. When it was discovered by the bishops of Egypt that he had rejected [his faith] they were furious, and they gathered to discuss his case and organized with him a dispute. They refuted him and his view was declared wrong. His incapacity pleased them and they sought to reconciled with him, displaying a friendly attitude and asking him to retract his view and to stop saying what he had wanted to prove and establish to them. But he did not, and they dismissed him from his position, after some public discourses. He lived until the conquest of Egypt and Alexandria by ʿAmr ibn al-ʿĀṣ. And he came to visit ʿAmr, who knew his reputation in knowledge and his position [on the Trinity] and what had happened to him with the Christians. ʿAmr honoured him and gave him a position. He listened to his speech about the impossibility of the Trinity and he was pleased with it, and he also listened to his speech about the cessation of the world and he was amazed by it; although he was using logical proofs. He listened to his philosophical expressions with sympathy although the Arabs did not know them [before] and he became fond of him. And ʿAmr was sensible, a good listener and thinker; so he took Yaḥyā [into his company] and did not like to depart from him. Then one day Yaḥyā said to ʿAmr, “You have control of everything in Alexandria, and have seized all sorts of things in it.” “Anything which is of use to you I will not object to, but anything which is not useful to you we have a priority over you,” said ʿAmr to him, (adding) “What do you want of them?” (Yaḥyā) said, “The books of wisdom which are in the royal stores; they have fallen under your responsibility, but you don’t have any use for them, while we do need them.” (ʿAmr) said to him: “Who gathered these books, and what is (so) important about them?” and Yaḥyā answered him: “Ptolemy Philadelphus, one of the kings of Alexandria; in his reign, science and the people of science were in esteem, and he searched for the books of knowledge and ordered them to be collected, and he dedicated a special store-houses to them. They were assembled, and he entrusted the responsibility to a man named Zamira; and he supported him in order that he could collect them, [after] searching for them and buying them and inciting sellers to bring them and he did so. And in a short time he had assembled 54,120 books. When the king was informed of the [successful] collect and verified this number he told Zamīra: “Do you think that there is a book remaining in the world that we don’t have?” And Zamīra said: There are still in the world a great mass [of books], as in Sind, and in India and in Persia and in Jurjan [ancient Hyrcania] and in Armenia and Babylonia and Mosul and among the Byzantines. And the king was pleased with this and he told him: “Continue in pursuing [your duty]; and so he did until the death of the king. And these books are until today kept and preserved as the responsibility of the governors working for the kings and their successors. And ‘Amr started to wish [to have] for himself what he was hearing from Yaḥyā and he was impressed with it, but he told him: “I cannot make any order without first asking the permission of the Prince of the believers ‘Umar ibn al-Khaṭṭāb; and he wrote to ‘Umar, informing him of Yaḥyā’s speech as we have reported it and asking for his instructions about what to do. And he received a letter from ‘Umar telling him [what follows]: “As for the books you mention, if there is in it what complies with the Book of God, then it is already there and is not needed and if what is in these books contradict the Book of God there is no need for it. And you can then proceed in destroying them.” ‘Amr ibn al-‘Āṣ then ordered by law that they should be dispersed in the public baths and to burn them in the bath’s heaters. And I was told that at that time several public baths used [the books] for heating, bringing some fame to new public baths which later on were forgotten afterwards and it is said that they had enough heating for six months. One who listens to what has happened can only be amazed ! The physician ‘Ubayd Allāh ibn Jibrīl ibn ‘Ubayd Allāh ibn Bakhtishū‘ said that the real name of Yaḥyā was Themistius. And he says that he was good at grammar, at logic and in philosophy but did not attain the rank of these physicians, that is to say, the famous Alexandrians such as ANQYLAWS (for Antyllos?) and Stephanos and Gesius (JASYWS) and Marinus. And it is them who organized the books [i. e. Galen’s books]. Some people say NQLAWS (Nicolaus?) instead of ANQYLAWS. This is what he said. But if he meant Yaḥyā, indeed [Yaḥyā] commented on a good number of medical books, and because he was strong in philosophy he became considered a philosopher because he was one of the famous philosophers of his time. The reason he became strong in philosophy was that he was working on a boat which carried people. And because he loved knowledge, when people from the House of Knowledge and the schools that were on the island of Alexandria were crossing with him, and were discussing the last lesson and the views exchanged, he would listen [to their conversation] and he started to love knowledge, and when his intention to study became stronger he thought by himself and said: “I have reached the age of forty-odd years and I have never started anything for myself, the only thing I know is seamanship, so how could I undertake anything in the field of sciences?” and as he was thinking, he saw an ant which had loaded [onto her back] the stone of a date and was carrying it, ascending her path with it, when it fell [from her back]. So she returned, took it up again, and continued in such a way until she had attained her goal and arrived where she was intending. When Yaḥyā al-Naḥwī saw that from her efforts she had reached her goal, he said, “if this weak animal can reach her goal by efforts and struggle, then of course, I would necessarily attain my goal by [putting in] some effort.” He went out and sold his boat and attended the House of Knowledge. And he started with grammar and language and logic, and he became excellent in these fields because they were the first he learned and he adapted himself to them and he became famous in these and wrote a number of books on them, commentaries and others. “Ibn al-Qifṭī,” or “al-Qifṭī,” although the latter applies rather to his father, who held from Qifṭ (ancient Gebtu) in Upper Egypt. As our author was a Muslim official who spent most of his life out of Egypt, and became the vizir in Aleppo of the Ayyubid ruler al-Malik al-‘Azīz, he cannot exactly be called “the one who held from Qifṭ” as in the Arabic usage of the kunya, or the nickname formed on the place of origin. Thus, although the use of al-Qifṭī or al-Nadīm instead of Ibn al-Qifṭī and Ibn al-Nadīm seem to be supported by some of the manuscripts carrying their names (and are adopted by an authority such as Ayman Fu’ād Sayyid in his latest edition of the Fihrist, under the title “The Fihrist of al-Nadīm” [London: al-Furqān, 2009]) I will refrain from doing so here and simply refer to the use of these two names (i. e.Ibn al-Qifṭī and Ibn al-Nadīm ) by Ibn Abī Uṣaybi’a in his Ṭabaqāt al-aṭibbā’ when quoting from their books. Severus is transliterated here as Shāwārī. By Yaḥyā or by his opponents is not clear. The expression “inqiḍā’ al-dahr” literally means “end of time”. “Dahr” carries the meaning of fate and time, and for this reason probably it is used here rather than Arabic ‘ālam, “world” which may be restricted to a physical connotation. The discussion about the “eternity of the world” does not address eschatological questions, as a modern reader could wrongly understand it but rather the question of time and eternity in relation to creation, whether creation came after a “big bang” or if time is eternal and cyclical. The Greek word translated as Lat. “mundi” in the title of Proclus’ treatise De Aeternitate Mundi (which was refuted by John Philoponus) is “kosmos.” There was an ongoing discussion among Platonists on the cosmology of the Timaeus which was later on continued among Christians in Late Antiquity and the Middle Ages. “al-Dahr” – i. e. the eternity of the world. Ibn al-Nadīm, Fihrist, p. 179 ed. A. F. Sayyid, reads 18 books, which agree with what we know of the number of Proclus’ arguments. Ibn al-Qifṭī reads “mawtuhu” (his death) while both Ibn al-Nadīm and Bar Hebraeus read “quwwatuhu” (its ‘potentia’). John Philoponus was known to have written a commentary on the De Generatione and Corruptione (see Ibn al-Nadīm, s. v. Aristotle, transl. Dodge, p. 604). I have emended the text which does not give any satisfactory meaning otherwise. Ibn al-Nadīm reads: “kitāb tafsīr mā bāl li-Arisṭāṭālīs al-‘āshir” [al-‘āshir, the tenth, may indicate here that Lambda was considered the tenth book, which remains a possibility if some books were missing, see A. Bertolacci, ‘On the Arabic translations of Aristotle’s Metaphysics,’ in Arabic sciences and Philosophy, 15.2, 2005, 241-275 (available here: homepage.sns.it/bertolacci/Art.16_2005.pdf)]. Ibn al-Qifṭī has “kitāb tafsīr mā bāl li-Arisṭāṭālīs,” which I emend as follows: “kitāb tafsīr mā ba‘d L li-Arisṭāṭālīs”. Bar Hebraeus does not mention a bibliography. See B. Dodge (translation), The Fihrist of al-Nadīm, New York 1970, p. 613, n. 174: this is year 627 AD. It seems that here a marginal note mentioned Themistius as the actual author of a commentary on Aristotle’s Metaphysics Lambda, while John Philoponus is not credited with one in Ibn al-Nadīm’s entry on Aristotle’s commentators. Naḥw, probably here for ‘rhetoric’. Lugha, came to designate linguistics but may here be used for grammar. Critical edition of the Koran in preparation? A page from a 7th century Sanaa ms. This is a serious business. A team of researchers at the Berlin-Brandenburg Academy of Sciences is preparing to bring out the first installment of Corpus Coranicum – which purports to be nothing less than the first critically evaluated text of the Qur’an ever to be produced. What this means is that the research team is in the process of analysing and transcribing some 12,000 slides of Qur’an mansucripts from the first six centuries of the text’s existence. Once that is complete, the way is open to producing a text that annotates and, presumably, provides some sort of exegesis on the differences found in the early manuscripts. The Potsdam-based team of Corpus Coranicum have so far concentrated on Suras 18 to 20, and are due to produce a first slice of the final product from that in the next few weeks. The whole book is meant to take until around 2025. 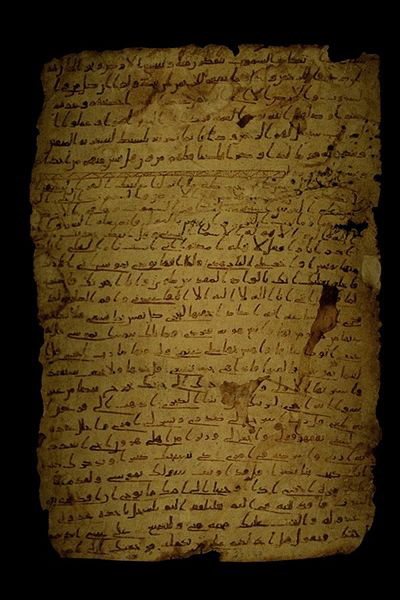 The project “Corpus Coranicum” contains two unworked fields of qur’anic studies: (1) the documentation of the qur’anic text in his handwritten as well as orally transmitted form and (2) a comprehensive commentary which elucidates the text within the framework of its historical process of development. Because of the ambiguity of the early defective writing system of the Qur’anic manuscripts, a strict separation of the data on the one hand provided by manuscripts and on the other hand transmitted via the tradition of recitation is recommended. The documentation of the Qur’anic text will provide a documentation for both traditions and compare them afterwards. The planned commentary focuses on a historical perspective, the Qur’an seen as a text which evolved through the period of more than twenty years, thereby getting formal and content-related differences through abrogation and re-definitions within the text. Furthermore, the commentary is based on an inclusion of the judeo-christian intertexts and looks at the Qur’an as a document of the Late Antiquity. “Corpus Coranicum” is in the early stage of its development; the first results are planned to be published online in 2009. That shows a very sensible approach. You eat an elephant a little at a time. Rather than working on a Koran text as such, work on the early witnesses to the text, the physical remains, the unvocalised scripts, and find out what we actually have from that period and what it says. Posted in Manuscripts, Other ArabicTagged Islamic manuscripts, islamic texts, Manuscripts3 Comments on Critical edition of the Koran in preparation? An email brings news of an interesting collection of papers in the Museum of Science in Oxford. These are the papers of H.E.Stapleton, who was a contributor to Ambix, the scholarly journal of Alchemy, along with F. Sherwood Taylor who translated Stephen of Alexandria. I’ve also been sent a catalogue of the manuscripts, which are mainly Arabic or Syriac. There are copious unpublished translations into English from unpublished Arabic alchemical manuscripts. There are 40+ Arabic manuscripts, mostly late copies. My eye falls on correspondance with Louis Cheikho in Beirut about the library there. There are also translations from the German of published articles. [loose inserts] some related loose inserts. I cannot say that alchemy interests me. But I really feel that material such as this should be online and accessible. Much of it is in typescript. Here we have an edited critical edition of an Arabic text, sitting forgotten in a basement. Mss. 50-138 are full of interest. My correspondant probably would like me to go to Oxford and photocopy some of it, and I suppose I could, although there is far too much to do in a day. But really he should go himself, and work with the papers. After all, most of the authors are just names to me, and I would probably miss stuff of the highest importance. But considering the quantity of unpublished English material, these papers really should go online.